The 42nd Indonesian Petroleum Association Convention and Exhibition (IPA Convex) ended today with both regulator and industry executives in agreement that forging a closer partnership is essential to build a better future for the upstream oil and gas industry. “Let’s work together and (be) more efficient,” Amien Sunaryadi, Chairman of the Special Taskforce for Upstream Oil and Gas Business Activities (SKK Migas), said in his closing speech. A panel of experts speaking at the 2nd plenary session of the 42nd Indonesian Petroleum Association Convention and Exhibition (IPA Convex) today shared a similar view that sensitivity and flexibility from the regulator are key in forging a productive partnership with PSC Contractors, thus improving the nation’s global competitiveness. The government will continue to streamline rules and regulations related to the upstream oil and gas industry in a bid to attract investors, President Joko Widodo said during his opening speech at the 42nd Indonesian Petroleum Association Exhibition and Convention today. “Our regulatory (environment) is still less conducive to attract investment. It is confusing and complicated,” admitted the President. The government and industry players must collaborate continuously in order to forge a better future for the upstream oil and gas industry and improve Indonesia’s competitiveness on the global stage, according to a panel of experts at the first plenary session of the 42nd Indonesian Petroleum Convention and Exhibition today. 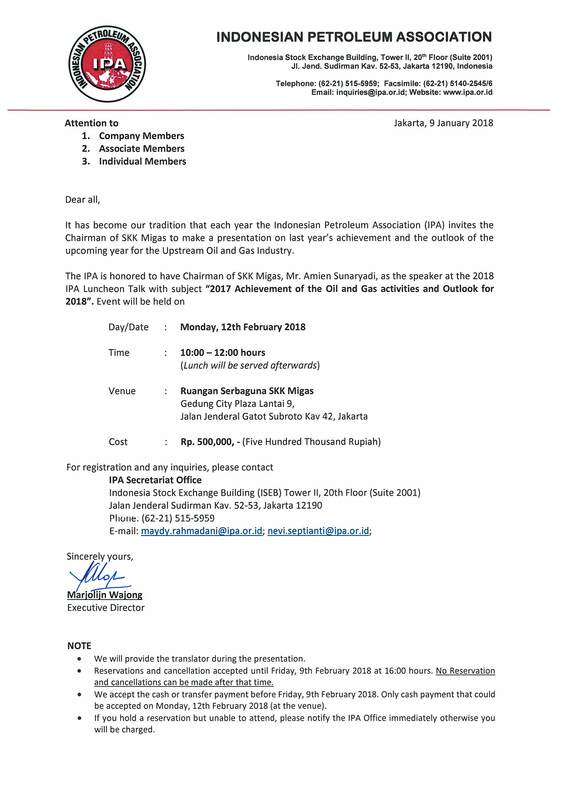 [JAKARTA] It has become our tradition that each year the Indonesian Petroleum Association (IPA) invites the Chairman of SKK Migas to make a presentation on last year’s achievement and the outlook of the upcoming year for the Upstream Oil and Gas Industry. [BANDUNG] The Faculty for the Future program, a flagship program from Schlumberger Foundation, awards fellowships to women from developing and emerging economies to pursue PhD or Post-doctorate studies in science, technology, engineering and mathematics (STEM) disciplines at leading universities worldwide. The fellowships represent the Schlumberger Foundation’s long-term investment in a community of highly qualified role models who help narrow the gender gap in STEM disciplines by inspiring more women to study science.